I have seen way too many of these books on this site that are STILL on the shelves. I know that the authors are trying to help, and for 1980 this is probably not too bad an attempt. It does bother me that these books seem to have the same theme over and over: Mommy is cranky and Daddy leaves. The example that follows is Daddy taking the child to get a hamburger and have an awkward conversation about custody arrangements. Again, I don’t see how this helps anyone, especially since nothing seems to be resolved at the end of the story. Short answer: I just don’t think these books age well. Youth librarians, please chime in on this one! Next Post:More Teens in Trouble! Oooo, I particularly like the hangman’s noose over by the window. Books with a message aimed at youth rarely age well. Still, that book should’ve provided some sort of resolution. 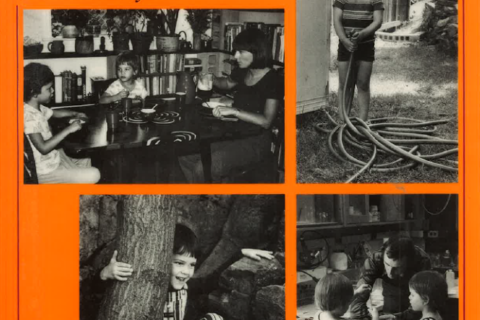 The book is 30 years old – weed it! What sort of resolution? 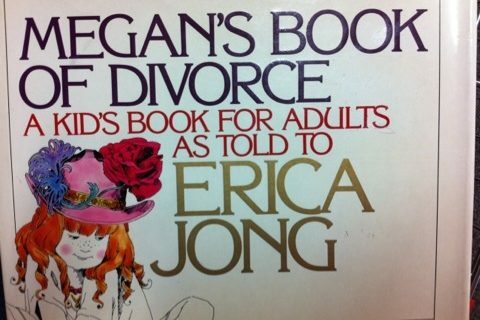 Divorces seldom end with a nice resolution, esp when there are children involved. You’re right: Books that prate toward kids seldom age well. You know why that is? Because they’re not any good to begin with. This one doesn’t really even have any particularly dated details. It just creeps us out. Why, why, why do people address children with this sort of condescending pablum? The kid’s parents are splitting up, and we prescribe some numbing self-help titles, is that it? “Books that prate toward kids”– As Lucy shouts, “That’s IT!” and Linus spins around and loses his shoes! I hate that stuff! Way to go with the passive-aggressive failure to take responsibility, Dad. I thought the same thing, But, I am a single (and jaded) parent and “Daddy Delightful” never has to take responsibility. According to the kids “he works”. Hmmm, I go to school full-time, have a part-time job and have the kids 90 % of the time. Oh, yes…he works seasonal work and it is casual at that. Can I say anything to the kids? Nope! I have to be the responsible adult. My kids are 12 & 14 and I speak about him in a positive light as they are half of both of us. If I put him down in front of them I am putting them down too. G, I noticed that too! That is the most depressing hamburger meal in history. I have been following your blog for awhile now. Very entertaining:) Can you tell me though where these books end up? That depends on the people and libraries that submitted them to us. Some get weeded from the library’s collection and sold in used book sales. Some of these we actually interlibrary loan from different libraries and they go right back on the shelf (sigh…). Some are in such horrible shape that they probably just get recycled. Thanks so much for the info. I am interested in illustration and the ones in this book caught my attention. Incidentally, you should see what the asking price is on Amazon. Gads! The cover art does kind of look like she’s thinking of either hanging herself with the cord on that shade, or possibly jumping out the window. Why is there never any divorce books where Dads get custody. I was raised by my dad and it always upset me that moms in the books always got custody and dad was a disinterested party. So those divorce help groups for kids never helped me cause they always assumed I was mistaken when I said my dad had custody. They thought it was, my Dad had visitation or joint custody. To be fair it’s still unusual for the father to get custody. Even more so when this book was published. People just naturally assume mothers are better at raising kids then fathers. 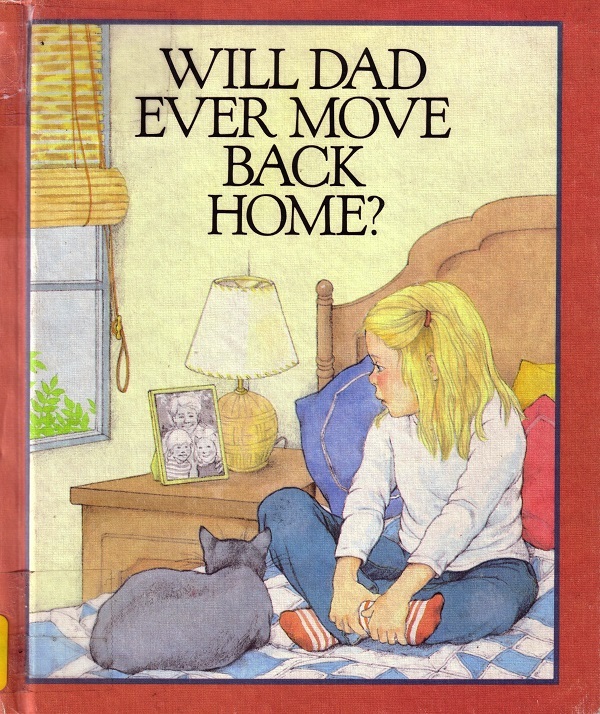 Since it’s often the moms who get custody they’re going to write mostly books about that. 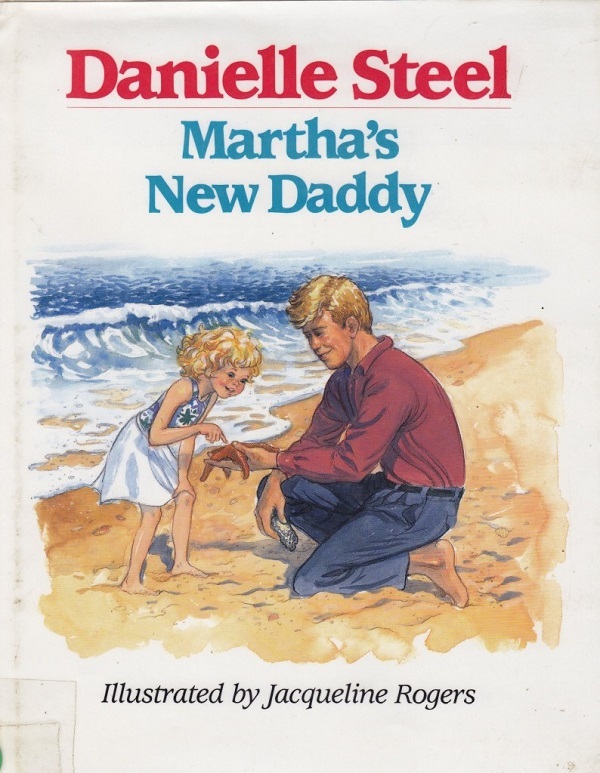 Its not that the book didn’t age well. Every divorce/separation is different. Legality shouldn’t play a part in moral compass. The kids may be staying with mommy, but what’s best isn’t always what’s legal. Holy Gila Monster dipped in peanut butter! I think Daddy just revealed why the divorce happened. His emotional IQ is zero and he has no understanding of empathy! I’m guessing personality disorder. You’re better off without him, kid! Man, it’s like Thomas Hardy’s long lost children’s book. You have won the Internet. Where would you like it sent? Daddy’s probably not paying enough child support. And even if he does, Mom is tired and cranky because she’s got to run the household by herself with no back up (any Navy brat will tell you how that goes–you don’t even need a divorce) and the poor kid is stuck in the khreppe-tastic grownup-created mess. I gotta give it points for honesty, even if it is a downer. I wonder what kids who come from broken homes prefer? 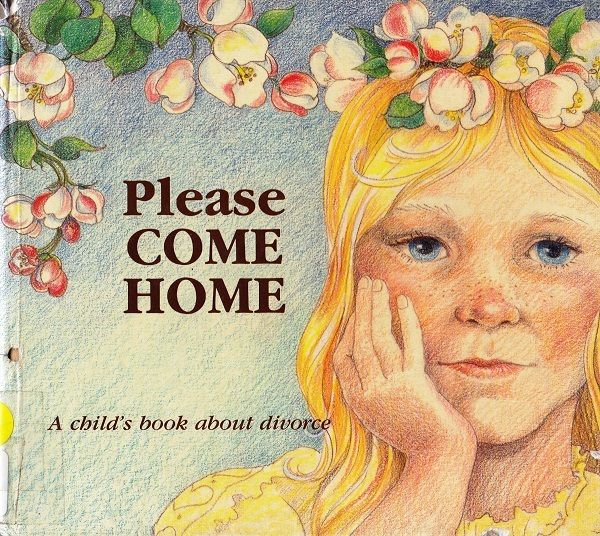 Kids who come from broken homes prefer not to be condescended to about the divorce issues, thankyouverymuch. Books written by adults for children in difficult situations usually *sound* like they were written by adults for children, and they grate. For example, if your parents get a divorce, you KNOW Daddy isn’t coming back home (ignoring sappy movie inventions to the contrary). Assuming, of course, that Daddy didn’t get primary custody. So who DIDN’T have a conversation like this with their parents in 1980, followed by the “if you don’t do what I want, I’m gonna go live with X” argument in 1990, followed by 2 decades of emotional detachment and unwillingness to commit to a serious relationship? Um, me. My parents will be celebrating their 38th wedding anniversary this year. My brothers also didn’t have this conversation. But that’s because their father was an abusive drunk who abandoned them (and mom) for an 18 year old girl and never paid child support. Thinking about it, I’ve never seen any children’s books dealing with that kind of issue. Where daddy’s idea of a Friday night is to get stinking drunk, beat the crap out of mom, then he eventually runs off with some naive young thing to repeat the process. I don’t see how this book is outdated. “You see, Daddy wants to have hamburgers with other women. 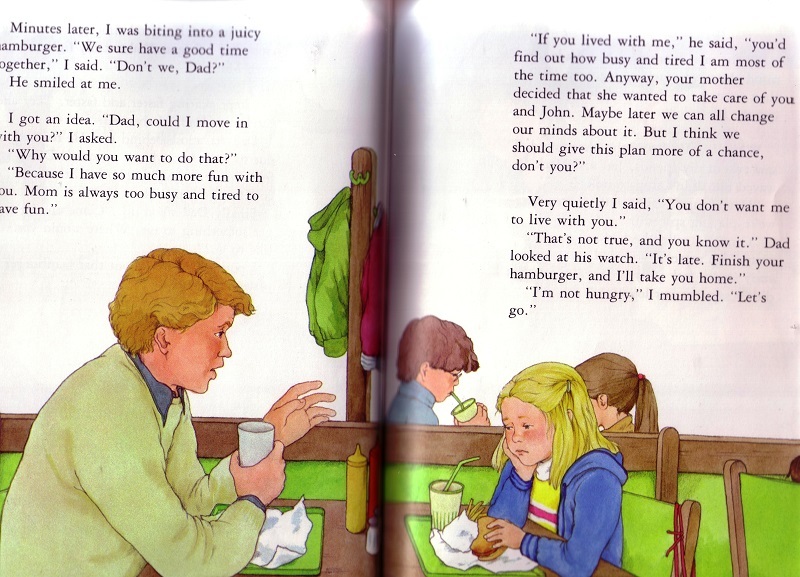 Before, Daddy was having a hamburger with his secret friend once a week. Once a week, that’s all! His secret friend never came over to our house for hamburgers, I swear! Anyway, Mommy found out about Daddy’s secret friend, and got angry about it. So, you see, it’s all Mommy’s fault that I’m moving out. I have to say that this is exactly what my ex did the night we told her of the impending divorce. This was right on schedule with the book, 1984. hahahaha I had to laugh out loud at the Thomas Hardy comment. We all survived and boy am I better off! Daughter too. I never saw a kid’s bedroom with her family pictures next to her bed, just cut up magazines with pop stars on the wall,mostly. Again,we just don’t understand the kids do we? As someone who grew up dreading that her parents might get back together, I found the dialog ridiculous. Did the author even talk to any real kids before writing the book? Or was it a way for the author to work out their own angry issues?